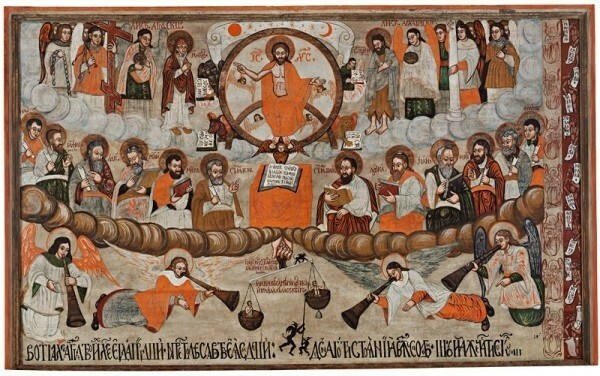 The iconographic work in our territory is a specific feature of its northern and especially eastern parts where the work of the Carpathian Circle operating on the boundaries of two cultural areas; two different but mutually affecting worlds. The independent existence of the collection of SNG icons is not a long one. It was founded after 1985 and thus it is one of the youngest and smallest collections in the gallery. 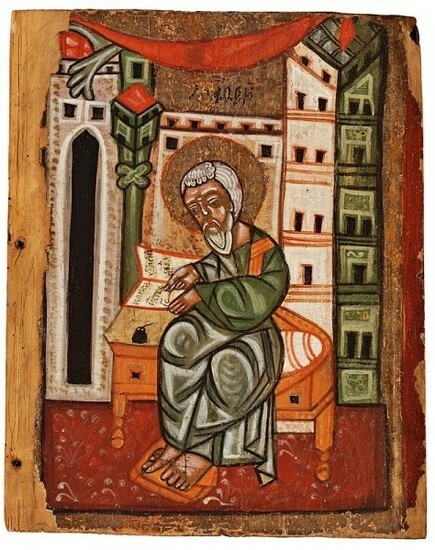 At the beginning, Eastern Christian sacral works were sporadically added to the gallery collections, mostly thanks to the personal initiatives of curators. Sometimes they tried to preserve these works ad hoc, through their non-systematic incorporation in various collections according to the current possibilities (especially in the periods when old - and particularly sacral art either fell into disfavour or enjoyed certain attention). The SNG acquired its first Eastern-Christian monuments in 1958 thanks to Karol Vaculík, the director at that time. 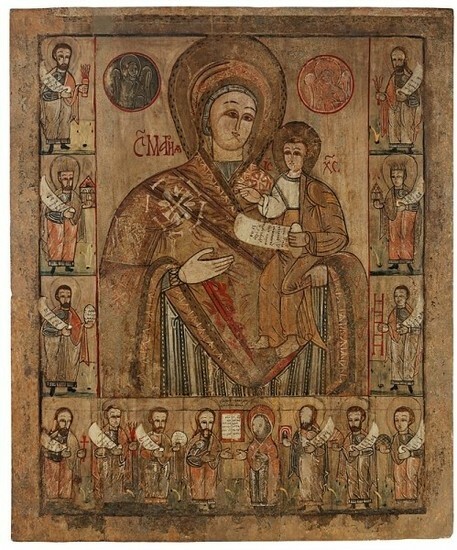 They included two relatively plain chamber panel paintings depicting Hodegetria, the Mother of God, from the second half of the 18th century and a rustic depiction of a saint (St. John the Apostle?) from the second half of the 19th century. There still wasn't any foundation of a significant collection of icons at this time. The turning point in the research of iconographic work in our territory and at the Slovak National Gallery came in the 1960s with the compilation and evaluation of the first list of iconographic works by Alexander Frický, a member of the Slovak Institute of Monument Preservation and Environment Protection (1967). Four years later, the author's interest in these issues resulted in the publication, Icons of Eastern Slovakia, and continued into the following period. The SNG also became actively involved in Frický's research of iconographic work on our territory in the 1960s. Štefan Tkáč, the head of the department of naïve arts at the time and the curator of the exhibition project Icons in Slovakia, played a key role. In 1968 he organized an exhibition (and also planned an international symposium) under the expert auspices of Karol Vaculík and certainly, to a large degree, with the participation of Josef Myslivec, an expert in iconographic work. This exhibition lasted only two months, but at that time it was the first, and in retrospect, extremely important impulse highlighting the need for a closer study of this specific material. It presents a representative exhibition of 106 icons from the 16th to the 19th centuries installed on the second floor of the gallery. As the catalogue of exhibited works confirms, the exposition was exclusively composed of works from other estates, since the SNG collection did not provide sufficient support at that time. In spite of this, Štefan Tkáč prepared a six month exhibition of icons from Slovakia for Palais des Beaux-Arts, Brussles (1973). Tkáč participated as organizer within the framework of the gallery and the Ministry of Culture. Seven years later, Tkáč's concentrated efforts resulted in the extensive publication, Icons of the 16th - 19th Centuries in Northeast Slovakia. The heightened expert interest and the change in attitude towards the iconographic work of the northeast parts of Slovakia at the end of the 1960s and the beginning of the 1970s also determined the approach to this issue in the following period. Numerous restorations, partial research and acquisitions were initiated and icons even appeared in some permanent expositions of the SNG (for the first time in 1976, but shortly after that they were de-installed). At that time, Magda Keleti systematically worked with the period of the early Modern Times in our territory in the Slovak National Gallery, including its iconographic form. She was also the curator of the exhibition, Icons of the 16th to 18th Centuries in Slovakia; designated for the Jiřský Monastery of the National Gallery in Prague in 1985 with a re-opening in Bratislava. 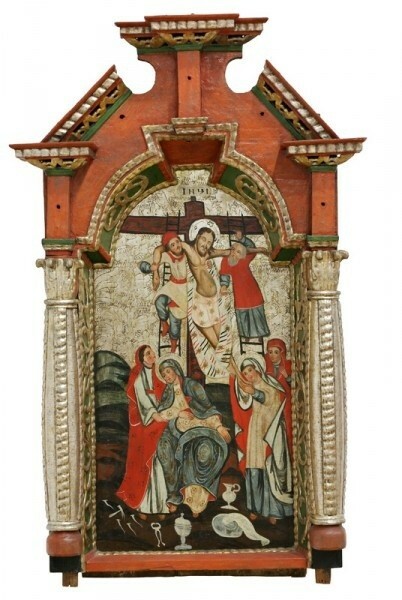 In connection with this exhibition, a new qualitative evaluation of iconographic work was made; building on the previous development, and this was reflected in 1985 in the internal transfer of a set of icons from the collection of non-professional art to the collections of the old art of the Slovak National Gallery. Since then they have been kept as a separate collection. At the end of the 1990s, the Slovak National Gallery presented icons in a separate exhibition at Zvolen Castle. They were also included in the extensive representative Gallery project, The Baroque Period, by which a long series of research-exhibition events entitled the History of Slovak Fine Arts began (both projects were implemented in 1998). Meanwhile, the gallery collection of the Eastern Christian monuments grew to almost hundred works through target-oriented acquisitions but also with transfers from customs seizures. Naturally, the core is represented by the local iconographic works of the Carpathian Circle from the 16th to 19th centuries. Furthermore, the collection also contains several Russian chamber icons of various quality, a series of small home altars by Russian metal founders from the 18th century, Ukrainian metal crosses and several miniatures as well as fragments of incomplete works. 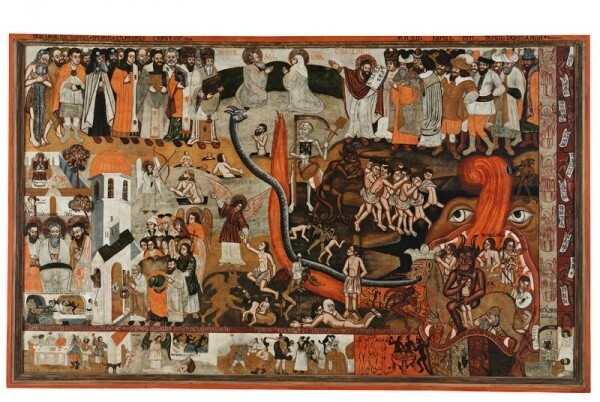 In addition to permanent expositions or smaller exhibitions of the restored work (Icon of the Last Judgment, 2002), the icons nowadays occupy a stable position in other presentations of SNG collections. Their recent incorporation in the exhibition-publication project, 111 Works from the Slovak National Gallery Collections on the occasion of the 60th anniversary of its founding (2008) and in the monograph presentation of artist Ján Rombauer (2010) confirms that. Recently, it was possible to compare the forms of our iconographic work with the Russian iconographic school on the premises of the SNG (at the exhibition The Russian Icon of the 15th to 20th Centuries, SNG 2010).